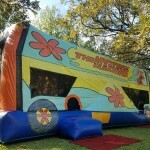 Jump City’s Scooby Doo Mystery Machine Jump, Climb and Slide Combo Inflatable has Bounce House, Rock Wall and Slide! Jump City’s Scooby Doo Mystery Machine Jump, Rock Wall Climb and two can Slide! Combo Inflatable Bounce House, Rock Wall and Slide! It’s a great item to have for cooperative players! It is ready for your children’s Party, or event. Rent one for your party today!